The present study aimed at developing improved rehabilitative intervention which can accentuate known therapeutical treatment for a better functional recovery from spinal cord injury (SCI). Furthermore, this research intends to utilize the passion of nursing care by bringing awareness among nurses for SCI patient’s care and opening avenues and interests in nursing research also. Young adult male rats were subjected to spinal injury and were allocated to five groups with eight animals in each, viz. Group 1 as normal uninjured control; group 2 as sham control; group 3 as SCI group with spinal injury; group 4 as SCI treated group A that were same as group 3 but were treated with a daily injection of Minocycline (50mg/kg) for 29 days and subjected to BBB behavioral test every alternate days; group 5 as SCI treated group B that were same as group 4 except that the animals were subjected to a daily enforced extra 5 tasks in same sequence as for exercises in BBB test. Minocycline had an attenuating effect on SCI in both treated groups A and B, however, the recovery in Group-B was observed to be significantly (p<0.001) greater than Group-A. It is concluded that enforced behavioral exercises in addition to drug treatment can enhance functional recovery. Furthermore, the present study can encourage the nurses to develop their nursing skills for SCI rehabilitation and their research abilities. Suitable animal models of spinal cord injury (SCI) for experimental studies simulating clinical conditions as observed in humans, are important source to understand the pathophysiology of the disease and to develop research modalities in search of effective treatment. Even till to date, humans with traumatic SCI need satisfactory physiotherapeutically related rehabilitation process and/or drug treatment. The aim of the present study is to understand the behavioral episode that is often an important phase following the initial primary injury, and to develop suitable rehabilitative intervention along with effective pharmacological agent that may enhance sensory and motor functions in an improved manner. Furthermore, the present research design may bring an awareness among the nurse communities working in occupational health set-ups, general wards, and specialized wards, to understand the need to show their passion for SCI patient’s care through exploring and learning standardized and improvised rehabilitation methods for managing and practicing effective nursing caring skills. Minocycline, a semi synthetic second-generation tetracycline, has been shown to have robust neuroprotective effects in rodent models of neurodegenerative diseases  and provide neuroprotection in experimental models of various neurological diseases including SCI [2-5]. Furthermore, minocycline has been shown to improve functional outcome, to reduce lesion size, to reduce cell death, and to alter cytokine expression after SCI [6-8]. In a murine model of SCI, minocycline treatment was superior to methylprednisolone, in promoting functional improvement  and had neuroprotective effects on SCI epicenter  and motor neuron recovery and neuropathic pain . Thus, the present study was designed to investigate the neuroprotective effects of Minocycline on behavioral recovery from SCI. Furthermore, from the perspective of educating the nursing community from a rehabilitative awareness point of view and to assess as to if the repetitive enforcement of SCI subjects to extra sequential behavioral activities in addition to pharmacological treatment do accentuate the rehabilitation process for a better functional recovery from SCI or not? Young adult male Sprague-Dawley rats, weighing 250-280g, bred, reared and housed under controlled conditions (diurnal 12-hour light-dark cycle, temperature 22±1 °C, humidity 5060%, free access to food and water) in the animal facility of the College of Pharmacy, King Saud University, Riyadh, Saudi Arabia, were used in the present study. All care was taken to minimize animal stress and suffering. Moreover, all animal practices and animal study protocols were approved by the Research and Ethics Committee of King Saud University, Riyadh, Saudi Arabia, for the humane care of animals. Rats were anesthetized with chloral hydrate (450mg/kg), and were subjected to spinal trauma by the modified method of Nystrom and Berglund . After shaving the back of the animal, a longitudinal incision was made on the midline of the back, exposing the paravertebral muscles. Laminectomy was performed under surgical operating binocular microscope, at T 7-8 level leaving the dura intact. SCI was produced by placing a metallic rectangular plate (2.5X5.0mm) loaded with a total weight of 35g for 5 minutes, over the exposed extradural area of the spinal cord for compression. The wound was closed in layers through aseptic surgical stitching and animals were allowed to recover from anesthesia by placing them on a warm heating pad maintained at 37±1 °C. All animals were given intramuscular injections of gentamycin at a dose of 3mg/kg for 3 days after surgery. The animals' bladders were manually pressed twice a day to avoid urinary complications until the rats were able to regain normal bladder functioning. Sham injured animals were only subjected to laminectomy with same surgical procedures without any compression. 1. Normal control group; without any laminectomy or compression injury. 2. Sham group; with laminectomy only but no spinal compression injury. 3. SCI control group; with laminectomy surgery and spinal compression injury. (50mg/kg) treatment for the recovery from SCI using behavioral parameter of BBB scoring every alternate day as described below. The dose of this drug was selected on the basis of our pilot screening at low, medium and high doses (25, 50 and 100mg/kg respectively). The best effective drug dose of Minocycline (50mg/kg) was selected based on those pilot studies. The drug was administered orally in the morning session always. The first dose of the drug was administered one hour after SCI and thereafter, daily for three weeks. The behavioral motor functions in the form of BBB scorings were observed in the evening session and were assessed in a blind manner. The scores of each test were evaluated the next day after injury and every alternate day for 29 days after SCI for each animal. BBB scoring: Hind limb motor function (including hind limb reflexes and coordinated use of hind limbs) was assessed using the Basso-Beatie-Breshnahan (BBB) locomotor rating scores . The method for scoring this BBB rating was modified in a sense that instead of placing the individual rats in an open field for the evaluation of the hind limb motor behavior, the animals were allowed to travel through a "Gait Performance Tunnel" (GPT). This innovative GPT consisted of a narrow tunnel, constructed from a wooden block of size (180X10X5cm) with side-walls made of clear perspex glass (180 X 18cm2), so that the animal movement was clearly visible from the side walls to the blinded observer and the score was assessed carefully for the rehabilitative coordinated movement of the hind limbs and placement of the hind paws. The GPT was placed at a height of 30 cm on the working table. The animal was allowed to enter at one end and travel through up to the other end. Soft bedding was placed under the other end of the GPT to avoid any injury in case of a fall from the GPT. No time was fixed for the walk in the GPT. The observer was able to assess the movements of hind limbs and placement of hind paws by the animals easily, through the Perspex glass sheet of the GPT Hind limb function was scored from 0 (complete paralysis or paraplegia) to 21 (complete mobility). SCI treated group-A and group-B were subjected to similar experimental processes to observe the behavioral parameter of BBB scoring every alternate day, except that the animals of group-B were further repeatedly subjected to daily additional 5 times enforced extra walking on the GPT in the same sequential order with an interval of 5 min rest between the walks. Thus, the animals of group-A after completing the BBB test on alternate days, were left in their home cages with no further disturbance. Whereas, animals of group-B, after BBB scorings, were subjected to additional daily enforced five extra walks through the GPT. After completing 5 additional extra walks, the animals were left in their home cages in a manner like group-A. The data from the experimental SCI group passing the normality test (p>0.10) were compared to the SCI uninjured control group, whereas the data of drug-treated groups were compared with the experimental SCI group using ANOVA with post-hoc testing using Tukey-Kramer Multiple Comparison Tests or Student-Newman-Keuls Multiple Comparison Tests. All results were expressed as means±SEM, and significance was defined as p<0.05 for the test . The results indicated that treatment with the drug Minocycline induced recovery from SCI with respect to time. Although the drug had an attenuating effect on SCI in both treated groups A and B as compared to the SCI only control group, the effectiveness of this drug on the behavioral recovery in treated Group-B was significantly (p<0.001) greater than in treated Group-A from SCI (Figure 1). The sham group showed minimal alterations in behavioral activities and attained similar scoring levels to the naïve control groups within a few days, indicating no contusion damage in the spinal cord. Although the behavioral recovery from SCI (in the SCI only group) in 29 days was lesser significant [F(1)=25.27, p<0.01] compared to the naïve control, the drug treated SCI groups A and B showed better and improved recovery in BBB behavioral scorings compared to the SCI only control group, and the drug treated groups A and B were effective in the order of Minocycline-groupB >Minocycline-groupA (F= 10.28 and F=5.83, df=2, p<0.001 and p<0.01, respectively) as shown in Figure 1. Results of scoring from behavioral parameters of BBB for assessing the recovery from SCI in all experimental groups (Figure 1) showed that SCI group exhibited severe deficits in hind limb function and moved using only the forelimbs, dragging the paraplegic hind limbs throughout the observation period. However, treatment with Minocycline in treated groups A and B when administered systematically after SCI, resulted in significantly recovery of functional deficits starting at 1-week post injury (p. i.) as compared to the SCI group. Because the functional recovery of both treated groups A and B differentiated significantly from the SCI controls from the earliest time point studied (3 days), the mechanism of the drug under study is likely due to neuroprotection rather than tissue regeneration, as suggested earlier . The treated groups recovered hind limb reflexes more rapidly, and a higher percentage of these rats regained responses comparable with those of injured untreated control rats. The treated rats also achieved a faster and greater degree of recovery of coordinated use of their hind limbs in maintaining their body position from 14 to 28 days (Figure 1). 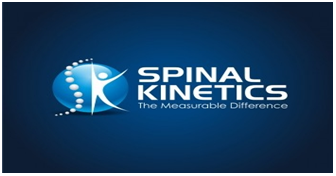 It is evidently concluded from this study that such interventions with enhanced physiotherapeutically related rehabilitation process can possibly be helpful to attenuate the repair in the traumatically injured spinal cord in humans as well. From the perspective of nursing care, the present study aims at serving as a model research activity for the general nurses and/ or the specialized nurses working in the field of rehabilitative services to the SCI patients in particular and in general to all other fields as well, working for improved mobilization of patients for better healthcare and wellbeing. Furthermore, nowadays, emphasis is laid on the increased clinical research leading to a need of innovated, improved and standardized education on research opportunities provided to nurses also. Thus, the present study can be a source of inspiration for the inextricable link for bringing change in the delivery of nursing care by the healthcare nurses and showing their compassionate abilities in clinical nursing practices. However, further detailed studies are required to confirm this presumption. The authors are thankful to the Deanship of Scientific Research, College of Nursing Research Center at King Saud University for funding this research. Kim HS, Suh YH (2009) Minocycline and neurodegenerative diseases. Behav Brain Res 196(2): 168-179. Garrido-Mesa N, Zarzuelo A, Galvez J (2013) Minocycline: far beyond an antibiotic. Br J Pharmacol 169(2): 337-352. Aras M, Altas M, Motor S, Dokuyucu R, Yilmaz A, Ozgiray E, Seraslan Y, Yilmaz N (2015) Protective effects of minocycline on experimental spinal cord injury in rats. Injury 46(8): 1471-1474. Ahmad M, Zakaria A, Almutairi KM (2016) Effectiveness of minocycline and FK506 alone and in combination on enhanced behavioral and biochemical recovery from spinal cord injury in rats. Pharmacol Biochem Behav 145: 45-54. Chin TY, Kiat SS, Faizul HG, Wu W, Abdullah JM (2017) The effects of minocycline on spinal root avulsion injury in rat model. Malays J Med Sci 24(1): 31-39. Lee S, Yune TY, Kim SI, Paark W, Lee YK, et al. 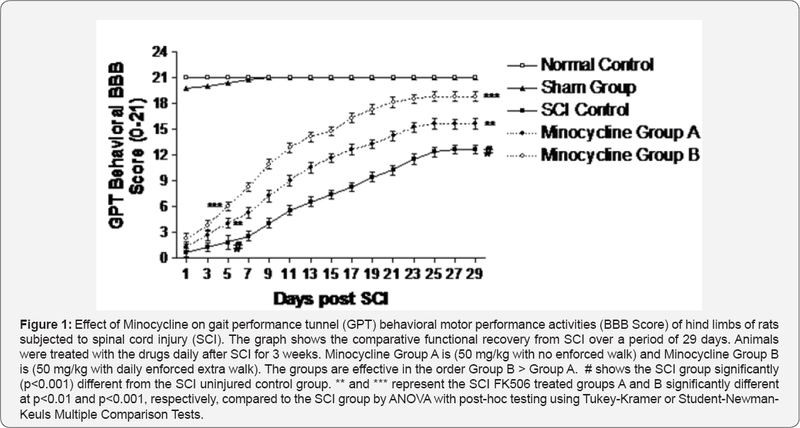 (2003) Minocycline reduces cell death and improves functional recovery after traumatic spinal cord injury in the rat. J Neurotrauma 20(10): 1017-1027. Wells JE, Hurlbert RJ, Fehlings MG, Yong VW (2003) Neuroprotection by minocycline facilitates significant recovery from spinal cord injury in mice. Brain 126(7): 1628-1637. Stirling DP, Khodarahmi K, Liu J, McPhail LT, McBride CB, et al. (2004) Minocycline treatment reduces delayed oligodendrocyte death, attenuates axonal dieback, and improves functional outcome after spinal cord injury. J Neurosci 24(9): 2182-2190. Saganova K, Orendacova J, Cizkova D, Vanickv I (2008) Limited minocycline neuroprotection after balloon-compression spinal cord injury in the rat. Neurosci Lett 433(3): 246-249. Cho DC, Cheong JH, Yang MS, Hwang SJ, Kim JM, et al. (2011) The effect of minocyclineon motor neuron recovery and neuropathic pain in a rat model of spinalcord injury. J Korean Neurosurg Soc 49(2): 83-91. Nystrom B, Berglund JE (1998) Spinal cord restitution following compression injuries in rats. Acta Neurol Scand 78(6): 467-472. Basso DM, Beattie MS, Bresnahan JC (1995) A sensitive and reliable locomotor rating scale for open field testing in rats J Neurotrauma 12(1): 1-21.